For about as long as I can remember, my family’s favorite soup has been Italian Vegetable Soup. That was actually the very first recipe I posted, and at my sister’s request, I snapped a picture of it. I had no idea that posting my recipes online would be so much more fun than just keeping track of my favorites! 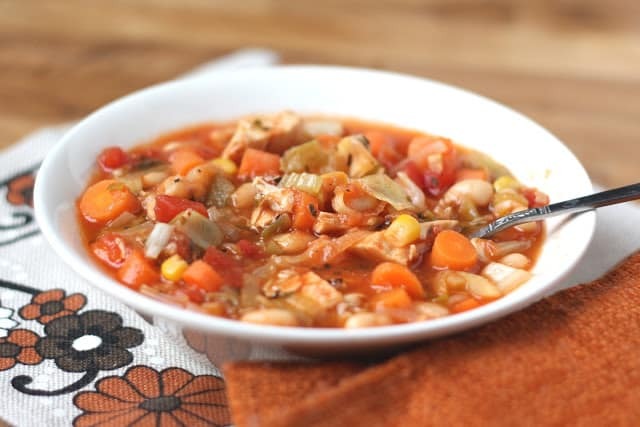 I’ve made different variations of this soup in the past and it is always delicious. There is something awesome about tender vegetables simmering in an Italian flavored broth that never fails to make me happy. This time, I added chicken and some marinara sauce that was in the refrigerator already. With what was the last of my haul from the farmers market, I added cabbage and a leek as well. I have no doubt I’ll be making this again very soon. In the bottom of a large stockpot, heat the oil. Add the garlic and onions and saute until tender. Add the chicken and cook until no longer pink. Add all remaining ingredients except for the corn and the cabbage. Reduce heat and simmer for 30 minutes. Add the cabbage and corn and adjust seasonings to taste. Bring back to a boil, then reduce heat and simmer until the cabbage is tender crisp, about 15 minutes. Enjoy! * This can also be made with leftover chicken. Simply dice the already cooked chicken and add at the very end with the corn and cabbage. This looks great - I have never thought to add marinara sauce to soup, but it sounds perfect! I don't know how you do it, Mary, but you make vegetable soups look incredibly good to me... and that is usually not an easy thing!! This is the kind of soup that gets my heart racing. Hearty and full of so many good-for-you ingredients! You are the hardest working woman in the blogworld! I can't believe the beautiful dishes you put out day after day. Let me know when your cookbook comes out - I want an autographed copy please! This looks fantastic. I can almost taste it! 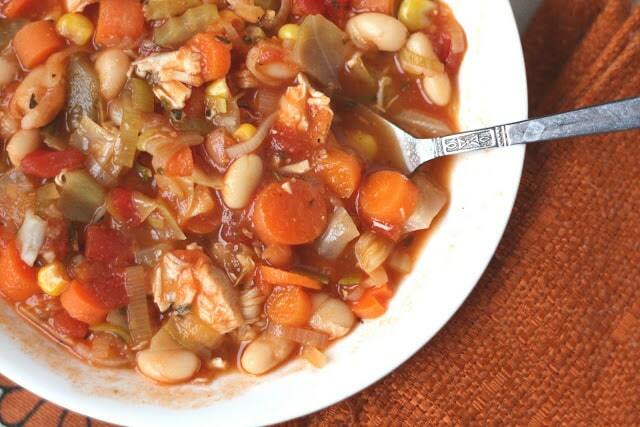 I love a great vegetable soup...this looks amazing! 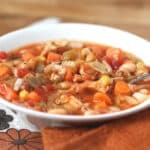 I love vegetable soups and this one looks great! That looks filling and tasty with all the chunki-licous ingredients!